See Our Size Run Chart Here! 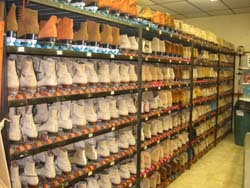 We have over 5000 used rental skates in stock. These skates were accumulated from rinks located all over the US. We probably have at least one skate of every type and brand that have been made in the last 35 years. I am sure we have what you want and some type of skate that will fit your budget. If we don't have exactly what you want, we will add it to our "NEED LIST" and keep our eyes and ears open to help fill your needs, or we'll do our best to find them for you. We will contact you as soon as we have your type of skate in stock. Our used rental skates are inspected for any defects or mechanical problems. The price for pairs of skates in quantities of 5 or less will be slightly higher than the "bulk" price listed. 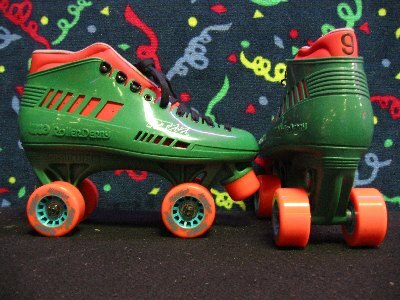 We have a type of skate that is used by "Skatetime" for school programs and these have indoor/outdoor wheels which are perfect for skating outside. "Skatetime" skates are top quality, they have all leather boots with comfortable padding and are very durable. They're excellent for outdoor skating. 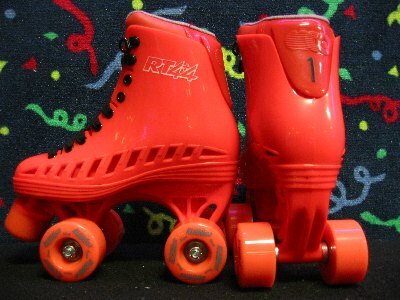 Our rental skates consist of high quality used rentals made by these manufacturers: Riedell, Dominion, Roller Derby (Pacer), and Golden Horse boots. We have smooth tan leather, and tan suede boots. These boots are mounted on Sure-Grip, Chicago, Pacer (Roller Derby), Marathon (Dominion), or Golden Horse plates. All adult sizes have precision bearings and juvenile sizes may have CrestLine Wheels, or Precision Bearing skate wheels. 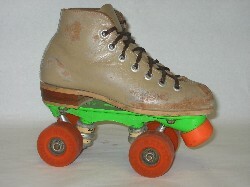 Some of our roller skates have new boots mounted on used plates and wheels. 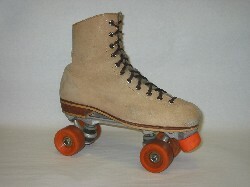 Many of our skates have discontinued boots mounted on close-out plates and wheels (the complete skate is new). Many of our used skates are from recently closed rinks that are in excellent condition, and can easily be used to fill in the sizes in your inventory. None of our skates have blown toes, rips or tears, no laces, or no toe stops. 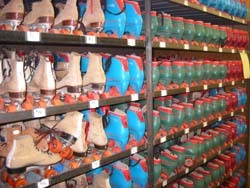 All of our skates are in excellent condition and can be put immediately in the skate rack to be used. We have a good stock of extra wheels and toe stops, both new and used. We have an excellent assortment of close-out and discontinued inline skates that are priced well below the valued range of most inline rentals. All of our skates are shipped by UPS Ground or UPS Freight, with which we have established a special reduced shipping rate. We are always looking for more skates to purchase, so contact us periodically because our stock is always changing. See Size Run Chart Here!